Ahhh…yes…the Ancient Egyptian Zodiac Sign Horus. Swiftly striking on the wings of a falcon, avenging his father's death, ruling the sky… Sounds like the perfect, dutiful son, doesn't he? Characteristics of the Egyptian Zodiac Sign Horus: If your sign is Horus, you have a very strong will. Some might even call you stubborn. You are a very hard worker and self-motivated. You aren't afraid of taking risk and often throw caution to the wind. You are optimistic and get along fabulously with others. Family is very important to you…and often, you place the needs of your family before your own needs and safety. Your great intelligence helps you to achieve the best in life. About the God Horus: There were multiple gods in Ancient Egypt who went by the name of Horus, and even more who had the shape of a falcon. Differentiating between them can be hard at times. Maybe for the Ancient Egyptians too since they merged all of them into the Horus of Edfu (shown in the featured image at the top of this page). 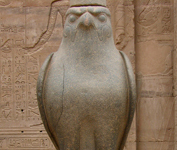 Horus didn't begin as an Egyptian God. He was the God of War for tribes that invaded Egypt and settled there. He eventually became a part of the Egyptian religion, first as the son of Ra, and later as the son of Osiris. Horus was the God of the Sky. He looked over both Upper and Lower Egypt, making him the god of the unified Egypt. He protected and guided the pharaoh, and was the patron of young men. The most famous story of Horus had him battle Seth after Seth killed Horus' father, Osiris. Legend has it that Horus still battles Seth to this day to keep the world safe. For the Ancient Egyptians, this story made Horus the example of the dutiful son who grows up to be a great and just man.